32 CSM 2018 New Year Statement. 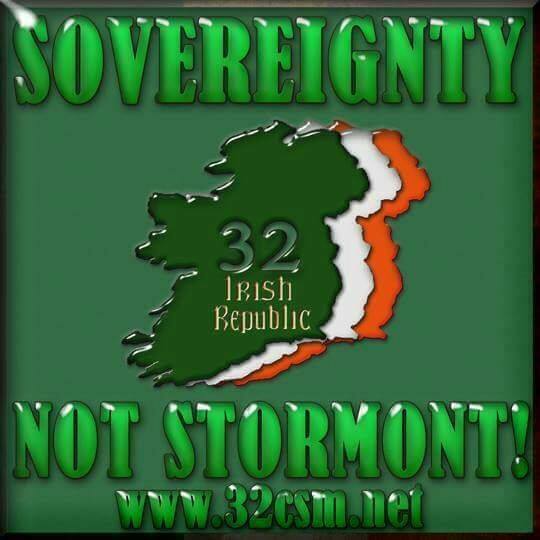 The 32 County Sovereignty Movement sends fraternal greetings to all republican and socialist comrades throughout Ireland. We send revolutionary greetings to all peoples struggling for liberation and justice throughout the world. We particularly note the struggles for national sovereignty in those Arab Nations who were brutally victimised by imperialist conquest. We send solidarity greetings to the people of Gaza and assure them of our unwavering support for the Palestinian cause. 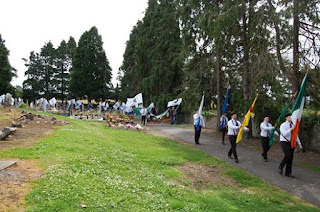 The continuing existence of Irish Republican POW’s and the strategic use of internment by remand lays bare the falsehood that the conflict in Ireland is in some way resolved. We send greetings to all POW’s, Internees and their families. We pledge our continuing support for the broad based campaigns fighting against these injustices. The year 2018 marks the Centenary of the 1918 General Election which democratically validated the Republic declared in the 1916 Proclamation. The key lesson for republicans today is to understand that pledging loyalty to that Republic is a poor substitute to actually building towards its realisation. This is the example which republicans of that period have set for us. They did not revert to paying annual homage to the Easter Rising but rather extended the core political demand of it by directly engaging with the Irish people to enact their national sovereignty. The challenge for republicans today is to continue this direct engagement to ensure the relevance of the Proclamation is made manifest in the daily lives of our people. The question of National Sovereignty is not simply concerned with securing a free vote, to now and again elect a government, but rather with the functioning of a just society where fundamental rights are integrated and guaranteed. Our message must reflect a clear schematic of the republic we envisage and outline viable strategies to pursue it. Republicans must involve themselves in a process which develops this message to demonstrate to our people that we possess the maturity and political acumen to act in their interests. Our conduct must be that of a disciplined and unified movement. The 32 County Sovereignty Movement have been fully engaged with likeminded republicans, from various groupings and none, to develop a radical policy platform that will bring the republican analysis into modernity. In the early stages of this engagement it was recognised that the vast majority of republicans in Ireland are not aligned to any current group and have no desire to be so either. Any political vehicle hoping to harness and give direction to their voice must be primarily focussed on message. The stern reality to be faced is that current republican groupings are wholly inadequate to constitute such a vehicle and therefore alternative strategies must be explored. The Proclamation Project is one such strategy that aims to address this task. Predicated on the principle that the better argument prevails it offers a democratic engagement for all republicans to converse in comradeship and equity to advance republican objectives. Our primary message for republicans in 2018 is to engage with this project so that our collective wisdom can be brought to bear on the many challenges that lie ahead. Since the creation of the Good Friday Agreement the 32 County Sovereignty Movement has put forward our position both in Ireland and on the international stage that the agreement will not lead to the restoration of Irish sovereignty. We in fact argued the opposite, that the Good Friday Agreement would in fact help Britain to copper fasten its rule in Ireland. We pointed to the acceptance of the unionist veto over Irish unity, the removal of articles 2&3 of the Free State constitution and the lack of any strategy beyond a sectarian headcount whereby any proposed referendum would ultimately have to be accepted by the British government. We also highlighted the contradiction of the British government who claimed to have no ‘selfish interests’ in Ireland while also claiming publicly that the North of Ireland was vital to their power in the UN, their economy and their Geo-political interests. Those who sought to enforce the Good Friday Agreement did so with false promises, hollow slogans, jobs for specific supporters as well as attacks and the execution of IRA volunteers under the ultimate direction of the British government. Those who pontificated about its chance to deliver a ‘shared future’, and an ‘Ireland of equals’ did so from a position of sectarian politics and savage cuts which were far from equal. While they maintained the mirage of delivering a United Ireland via a referendum which they hoped would deliver Irish unity. Its proponents believed in convincing unionists to support a United Ireland as well hinging its achievement the rising birth rates of Catholics who would traditionally be from the nationalist community. While again, we in the 32 County Sovereignty Movement pointed to the ridiculousness and contradictions of such a strategy. Now we have seen in recent weeks the Southern government, Stormont and the British government all claim that the 50+1% vote constitutional nationalists were hoping to achieve is no longer a big enough margin to secure unity in any such referendum. They now claim that the ‘overwhelming majority’ within the North of Ireland, must vote for Irish unity. This has created the peculiar position of annihilating the position of those who supported Sinn Fein’s stance and the Good Friday Agreement as an internal settlement which could achieve a United Ireland. While some may insist these statements are contrary to the agreed settlement, the settlement also contains the stipulation that the results of any referendum on Irish unity must be accepted by the British government. Once again we see that the Good Friday Agreement does not offer any path to Irish Unity. Neither has it removed sectarianism, ended political oppression or delivered any form of equality. Only when the British occupation of Ireland ends, can we secure the sovereignty of Ireland and the sovereignty of the Irish people. Martin Rafferty at fringe meeting of the Labour Party Conference. Martin Rafferty at a fringe meeting at the Labour Party conference entitled The Labour Party for a united Ireland. On the Panel was Paul Maskey SF Geoff Bell author and Ken Loach film director of such films as The Wind That Shakes the Barely and Jimmys Hall. They both also claimed that a boarder poll would be the first time that the Irish people alone would decide if there would be a unification of our country or not. When asked if the poll would be an all Ireland vote they both said yes. Martin felt he had to tell the people in the room that that was not the case and both Maskey and Bell, when pressed, admitted they know this was not the case. When Ken Loach got up to speak he agreed with Martin that it should be for the Irish people alone to decide their future and Britain should begin the process of leaving. 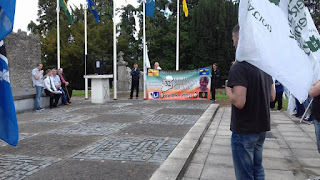 It is important that we Republicans go to these places and expose the lies being peddled and inform people looking to get involved in the unification struggle that constitutional nationalists will never deliver and the best thing for them to do is to campaign for their government to start the process of withdraw. In these changed times Irish republicanism must have the courage and foresight to adapt to the political environment we find ourselves in. A fundamental recognition of these changed times is an essential prerequisite to political advancement. Our objectives remain the same. It is our strategic approach to their pursuit which must change. Political and constitutional change is all around us yet republicans have been redundant as regards influencing these changes. Despite our objections, despite our take on history the voice of Irish republicanism is a whisper in the storm. The importance of our objectives to the Irish people demands their inclusion in any strategic framework in pursuit of those objectives. We can no longer view the republican struggle as a struggle for the Irish people but rather as a struggle with the Irish people. In recognising the people as the nation we are duty bound to engage with the views of the people irrespective of whether we agree with those views or not. The road to the republic does not involve bypassing the Irish people. The challenge facing republicans is to integrate our objectives with the daily objectives of our people’s lives. As we hold the people to be the nation their wellbeing and the wellbeing of the nation are one. National self-determination and national sovereignty are the fundamental rights of the Irish people but they only hold value if they themselves facilitate the functioning of other national and individual rights essential for social equality and social justice. If the minds of our people are on these rights and challenges then it is there where the republican narrative must concentrate. Their concerns deserve more than clichés and platitudes. We need to bring a national dimension to local politics. Republican focus must now be centred on building a policy platform around which republicans can fully engage not only with our people but also with each other in pursuing these rights. Without question republican weakness is due to republican disunity. This is the first task which needs to be addressed. Over the last number of years genuine and productive progress has been made in this field. The centenary of the 1916 Easter Rising afforded republicans an unprecedented opportunity to focus all our efforts on a unified goal. Working with the National 1916 Commemoration Committee a broad spectrum of republicans set in place a template within which republican unity could be constructed. Recognising that no republican group was advancing our struggle the focus of the initiative centred on the republican message instead. Crucial to the project was the restoration of basic comradeship amongst republicans which required that most powerful of political acts, the act of sitting down and talking to each other. What evolved was a pragmatic plan to give solid direction to the Republican Movement over the next five years. The fruits of these endeavours harvested the concept of Applied Republicanism which brings a contemporary relevance to the republican message. Preaching history or abstract ideology will fall on deaf ears because our people have more immediate concerns. Our task as republicans and socialists is to provide alternative solutions to those concerns in a way that demonstrates that true sovereignty and national self-determination is the ultimate solution. But Applied Republicanism observes that the republic we strive for is not an end point but a constant work in progress. An Irish Republic will not fall from the sky nor be yielded from a so called border poll but will be built on the foundations of established rights secured by republican and socialist activism. Republicans have always feared that social politics could distract from the national question. But the point we need to stress is that social politics itself contains many national questions the answers to which demands the removal of partition. Therefore it is imperative that republicans and socialists integrate social and national struggles in order to achieve both. To give real expression to this task republicans and socialists have set in place the Proclamation Project as a mechanism for revolutionary political activism. Over the next five years we will witness the centenaries of some of the most prominent events in republican history. These events will place in the national narrative issues which currently Irish republicanism would be unable to do. The 1918 General Election, the formation of the 1st Dáil, the Democratic Programme of Dáil Eireann, the Declaration of Independence, the War for Independence and other salient events will be marked by the Proclamation Project drafting a social schematic of how we envisage an Irish Republic will function for its people. We in the 32 County Sovereignty Movement are privileged to be working along side republicans and socialists from other groups and those unaligned. We give our analysis as diligently as we listen and engage with the analysis given by others. We are not at this table simply to convert others to our point of view but to merge the collective strengths of all views to move this struggle forward. Our Submission to the United Nations lays down the legal foundations of the liberation struggle. But that is just a starting point. Other republicans have brought invaluable grounds to politically build on and have opened doors through which dialogue and engagement with social movements has already begun. This initiative is a true commemorative act of the father of Irish Republicanism Theobald Wolfe Tone. His own vision for Ireland was also centred on a unifying premise. Uniting Catholic, Protestant and Dissenter was his equivalent of our imperative of uniting the indebted, the evicted and the exploited. As an occupied country other rights come into play. The Irish people have the right to employ armed struggle to end the violation of our national sovereignty. But this right, like any other right, is not a blank cheque. Possessing a right does not automatically infer that the right be discharged nor does it automatically confer an ability to properly discharge that right. Any right which is discharged in an arbitrary or deficient way does irreparable damage to that right. In these changed times it is not business as usual. 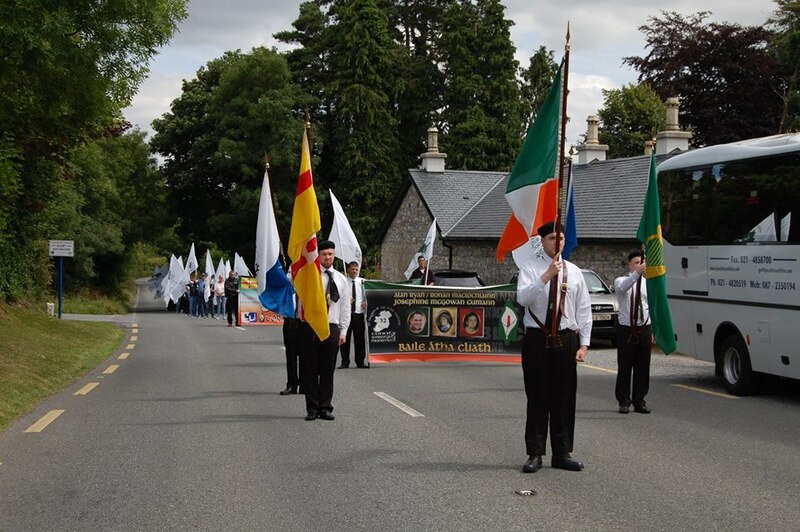 Armed struggle is not nor can ever be the default position of the Republican Movement. Whether we like it or not the Irish people believe that the Good Friday Agreement offers a peaceful route to a United Ireland. This does not mean that they are wrong. It means that we as republicans are unable to convince them that we are right. Pointing a gun at them will not alter this fact. The policy programme envisaged by the Proclamation Project is the proper political response to partition at this time. In conjunction with the Good Friday Agreement both Brexit and the real possibility of Scottish Independence have dramatically changed the constitutional politics on these islands. Westminster and the permanent security apparatus which governs the United Kingdom are now in a process of consolidating that political entity. The occupied Six Counties will play a central part in those deliberations. This goes beyond a mere numbers game like the DUP propping up a minority Tory government. Westminster too are in changed times and we need to recognise this because this will determine their political attitude and strategies towards Ireland. From this hallowed platform we in the 32 County Sovereignty Movement urge all republicans and socialists to work as equals with the Proclamation Project to confront these changed times with a pragmatic confidence that can advance our struggle. There is nothing stronger than unity. In these changed times we need to be strong. 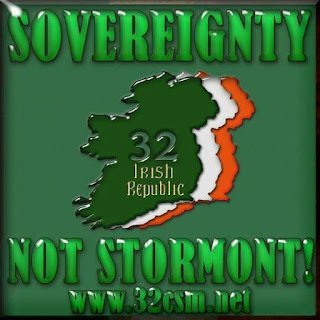 SOVEREIGNTY NOT STORMONT THE FUTURE. The continued failure of Stormont is a direct result of the continued violation of Irish sovereignty and the fact remains that it is impossible to serve two opposing positions. Provisional Sinn Fein’s position has failed the republican agenda and it is now imperative the British Government recognise the failing of such an experiment and move to an Irish solution to an Irish problem by removing their sovereign claim to the 6 occupied counties. Brexit poses many challenges to the people on this island and the onus is on the Dublin administration to rise to the challenge in upholding the sovereignty of the nation having now recognised the mistake getting rid of the territorial claim in 1998. 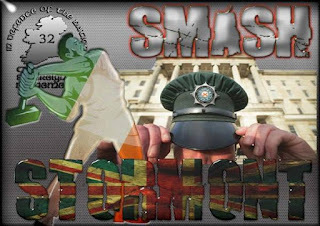 The Stormont experiment is over, there is no returning to such failure and the only option is to uphold the sovereign rights of the Irish people. The election in March is effectively electing candidates to nothing so what is its purpose other than to camouflage the ongoing failure. The vilified position adopted by the 32 County Sovereignty Movement in 1997/98 is now vindicated and that analysis is proven to be correct. Exit strategies from the failures are not in themselves solutions, therefore moving forward must ensure the sovereign rights of all Irish citizens are upheld. There can be no return to devolved or direct rule as both are violations of the rights of the Irish people. That message must now be the mantra for all who claim to represent and uphold the interests of the Irish people. We gather here with an even deeper sense of tragedy given that Alan's brother Vincent is now at rest with him. And it also drives us to seek a deeper understanding of why these events came to pass. Two of our comrades are dead; taken from us by criminal elements. At what point in republican thinking and planning did this confrontation arise? What policy or republican objective was served by this confrontation and its lethal consequences? Where was the strategic merit and return for Irish republicanism? The addressing of these questions is an essential ingredient in truly honouring Alan and Vincent's legacy. For as much as we must continue to question every aspect of what led to the murder of IRA Volunteer Alan Ryan we are also left with that deeds legacy, which will simply not go away. The entire republican family is impacted by this negative legacy and there rests a corporate responsibility to address it. As republicans we must be defined by the message we present to our people. The veracity of that message will be judged by the policy platform that we develop in its pursuit. What Alan fought for must be articulated in a way that breaks through the wall of negativity that the State and State media maintains around us. Republicanism must be more than a set of initials or a broad stroke slogan of intent. To be relevant we must be effective on the ground and to achieve this we must adopt a dual approach: a concept of actually winning this struggle and a radical policy platform to give structure and focus to our struggle. The core objective of Irish republicanism remains the same. The political environment within which we fight for it however is constantly changing. We have to learn to both adapt to, and manipulate, those changes for republican ends. Every generation of Irish republicans have the absolute right to bring their own ingenuity to bear to further this struggle. It is not an objective or principle of the Republican Movement to anchor itself in a historical rut no more than it is an objective or principle to pass this struggle on to the next generation. That the British presence remains in our country is a clear indicator that up to this point Irish republicanism has failed to realise our core objective. We owe no loyalty to failure. We have no duty to engage in yet more glorious defeats. When we glorify failure we institutionalise it into our strategic thinking. This is the malaise at the heart of current republicanism. Without a concept of winning we cannot work through the problems we cannot avoid. And we cannot avoid each other. Each time a republican group fractures we take failure to new levels. Each time a separate republican entity comes into being we further undermine the potential for Irish republicanism to advance. At what point are we going to say stop to this madness and press the re-set button? We cannot stand at the graves of our patriot dead and honestly say this is the best Irish republicanism can do. We cannot stand within our communities and convincingly say that we are here to work with you. We have to rise above the personality and work together to once and for all win this struggle. If we intend to bring this struggle into our communities we must come armed with a message that resonates in their lives. We must engage in a narrative that is relevant to our people's needs both locally and nationally. What we offer must be plausible and understood as such. It is this policy platform that republicans and socialists should concentrate on building. It is here were we can work together and reintroduce a true sense of comradeship into republicanism. The last thing our communities need now is yet another set of initials claiming to be something new or different. If we hope to assist our communities with the many problems they face then we must seek to educate ourselves from those who work at the coalface of issues like substance abuse, evictions and debt. Waving the Proclamation at such issues is not a solution to them. Quoting Marx is too distant an endgame. We must make the Centenary year of the Easter Rebellion a watershed for Irish republicanism. We must define the criterion to claim to be a republican organisation in a very different and onerous way. A name, a logo and a Facebook page simply does not cut it. This struggle is a national struggle built on the integration of local and national activism. And this activism can only be gauged by the positive political effect it has at each level. Without any political effectiveness it is nothing more that political noise. There is no interpretation of the Republican Constitution that allows for a deliberate policy of not seeking republican unity. A fractured base needs to heal. To do this honest and open dialogue is required. There is no point in espousing radical ideas with a mindset that has proven to have failed. A change in mindset is as essential as it is eminently achievable. And this is the start point for every individual republican. This is the most important first step. As you leave the graveside of Alan and Vincent remember them through actions that will ultimately lead to the Republic.